There are many treatment methods, even for advanced clinical pictures. The most important of these are compression treatment and surgery. Wearing compression garments regularly can help prevent or even stop progression of the disease. 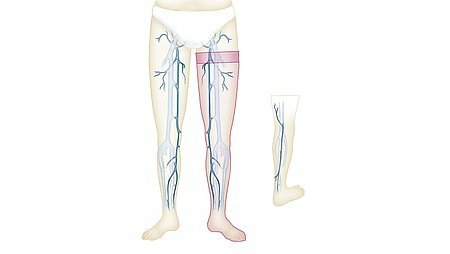 Medical compression stockings form the basis of the treatment of veins. If the disease progresses, the patient may develop oedema and thromboses (blood clots) or even venous leg ulcers. A life-threatening situation develops if a blood clot is dislodged from the venous wall and carried by the venous system into the lung. This is then called a pulmonary embolism. Compression hosiery is a common means of halting the progression of venous insufficiency. With its exactly defined pressure, it mechanically counteracts venous valves that don't close properly. When the diameter of the veins in the legs is narrowed, the valves can close again and the blood does not pool. The garments also stimulate lymph flow and prevent the stasis of fluid in the legs. Modern compression stockings are nowadays indistinguishable from other sorts of hosiery. Whether fine ribbed design knee stockings, semi-transparent stay-ups (thigh-length stockings) or pantyhose in a bewildering array of colours: from the fashion angle, there is no limit to compression stockings. "Stripping" is the best-known surgical technique. For this operation, a probe is inserted into the vein, which is then pulled out of the leg through a small incision in the skin (stripped). Not all affected trunk veins have to be removed. If only the top part is affected, the operation spares the trunk vein. This means that the healthy section of the vein is retained. There are many different variants of "vein stripping". Another possibility is to occlude or block the defective vein. This is done either by a so-called crossectomy using laser or radio wave treatment. The veins can be treated in a variety of ways. Here you can learn about the common surgical procedures. A probe is inserted into the diseased vein at the thigh and advanced down to the foot. The varicose vein is then pulled out of the leg. The distended veins are tied off so the blood can flow through the healthy side branches. The saphenous veins are retained. The vein is melted from the inside by a laser probe, as a result of which it is obliterated permanently and later broken down by the body's own processes. The procedure is similar to laser therapy: a tiny probe is inserted into the vein. The varicose veins are thermally sclerosed with radio waves and broken down by the body. 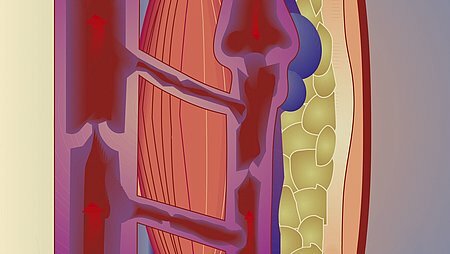 Sclerotherapy uses an injection to cause the vessel walls to stick together. The body breaks down the obliterated vein. Besides the classic method, there is also foam sclerosis in which the veins are sclerosed with foam. Immediately after the operative procedure, a compressive anti-embolism stocking is worn (e.g. mediven struva). After this, medical compression stockings (e.g. mediven elegance) must be worn consistently. The doctor can prescribe these if necessary. Medical retailers measure patients for their stockings. They are active breathing and, with their wide range of colours, provide a welcome change for the legs.